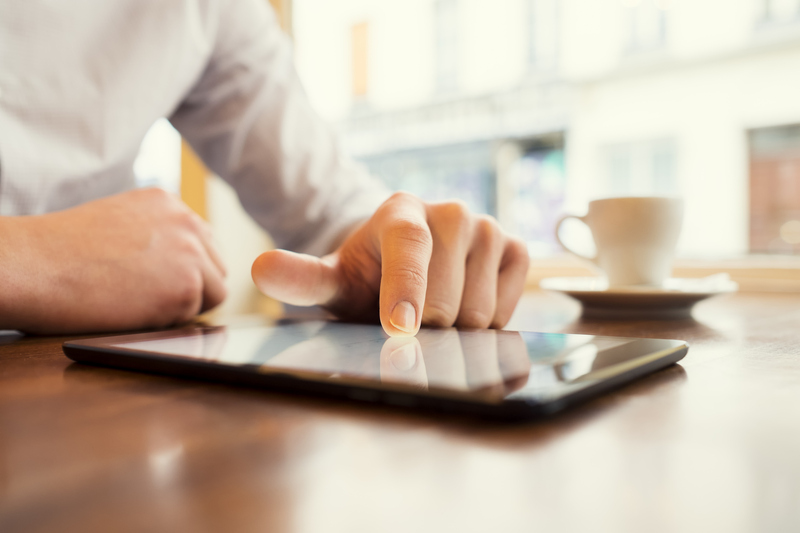 If you discuss the current transaction environment with healthcare professionals, Physician Practice Management (“PPM”) deals would be one of the hottest trends you would hear about. Strategic operators looking to defend their existing facilities from competition and private equity buyers seeking to deploy idle capital have made acquisitions of physician practices in specialties such as orthopedics, dermatology, gastroenterology and ophthalmology wildly popular. Rumors abound about the volume of transactions, double digit multiples and opportunities for consolidation in the market. These dynamics and the failure of the original Physician Practice Management models that began in the 1990s has generated intense interest in the space. With minimal historical EBITDA, how can you justify such high purchase prices? Can strategic operators stay competitive with private equity buyers that are paying huge premiums? How are these models different from the companies that failed in the late 90s and early 2000s? Is the PPM model actually sustainable this time around? What are the doctors paid going forward? How viable is that compensation level into perpetuity? What is the plan for physician retention, recruitment and replacement? In three words, have you though about salary, sustainability and succession? In valuation theory, a multiple basically has two components: growth and risk. Practices with high growth prospects would command a higher multiple than an identical business with fewer expansion opportunities. Example of common growth avenues can be numerous bolt on acquisition targets in the local market, a young physician base that still has capacity to see more patients or new ancillary services that can easily be introduced. While growth can be straightforward, the risk a buyer is incurring in a deal might be harder to identify and quantify. Many of the major risks in a PPM transaction center on the subject physicians and their incentives going forward. The first risk component that comes to mind in this hypothetical transaction is the proposed clinical compensation model. In this example, the doctors are basically accepting a 30.0% buy down in go forward clinical earnings for an upfront purchase price. With such a large upfront payment, it is no surprise that most physicians would find this transaction appealing. How should a buyer analyze this structure and the assumed valuation? The first question that should be asked is if that salary is market for the amount of clinical services rendered. Will that lower level of clinical compensation hurt their productivity in the long run? Can physician production be replaced at these compensation levels if a physician was to leave or retire? The laws of economics indicate that if the price of an asset or service declines, the supply of that asset or service will also be reduced. With future productivity directly effecting future EBITDA, these are significant risks that need to be taken into account in any valuation analysis. The selected multiple should consider the amount of historical compensation that is purchased based on these dynamics. 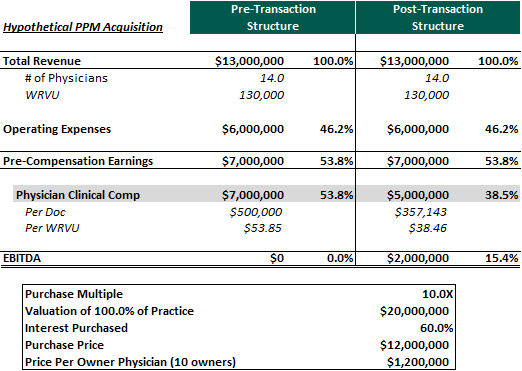 Many physician practice management operators attempt to “repair” physician income over time by growing EBITDA through bolt on acquisitions, the introduction of new ancillaries, expense management or other synergies. Growth in EBITDA can increase equity distributions and thereby help bring the owner physicians’ total take home pay closer to what they made historically. Another avenue that PPM operators may pursue for income repair is through improved managed care rates. If a PPM is able to grow and obtain scale, size and scope it can theoretically create leverage opportunities with payers for potential rate improvement. If the physicians are compensated through a revenue or earnings based model, an increase in reimbursement would increase clinical compensation without the need for increased productivity. The viability and sustainability of the PPM may improve if it is able to effectively achieve income repair through one of these avenues. 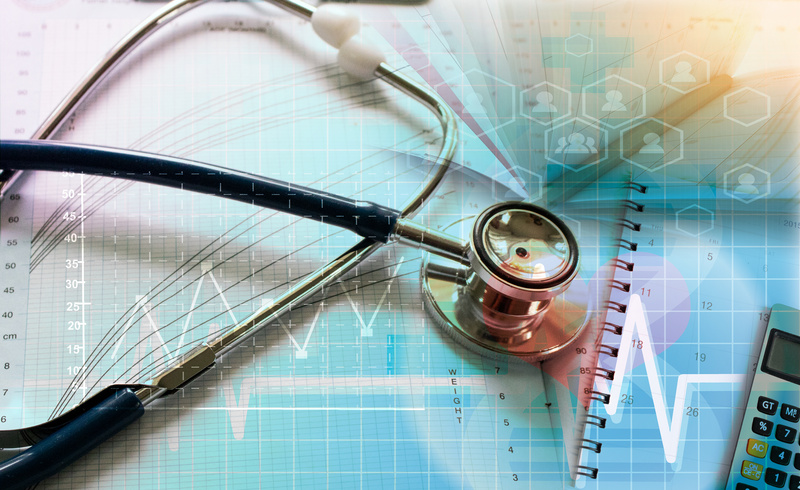 When the junior physician partner buys equity in the PPM, the sponsor may dilute which could significantly impair the value of its investment. The other option is for the legacy physicians to dilute which diminishes their earnings. Lowering physician compensation is usually not what operators are trying to accomplish, and as a result, the sponsor is the party that dilutes in most cases. This expected future dilution, if significant, should increase the risk of the deal and needs to be considered in the valuation on the front end of the transaction. This aspect non-withstanding, the junior physician would also have to write a check to invest in the PPM’s equity. With a high valuation multiple, this outlay could be considerable and return modest if future growth is not achieved. If a significant capital investment is a physician’s only avenue for increased compensation at the PPM, he may contemplate other employment opportunities where his productivity will generate “partner” level compensation without the need for a large personal outlay. Some PPMs try to minimize this issue by allowing junior physicians to buy-in at a discounted multiple (lack of marketability/control). In this scenario, the physician’s investment would be lower and returns higher. However, the sponsor or existing partner dilution previously discussed could be magnified. Over the years, operators have attempted to find creative ways for junior physicians to become equity holders without requiring a large investment by granting profits interests or other forms of phantom equity. If the physician practice is able to grow and increase equity value, these securities can generate substantial value for junior doctors and no upfront consideration is required. Finally, the other option would be to not have the junior doctor buy equity, but to increase his clinical compensation to levels consistent with senior partner take home pay. This option could decrease EBITDA, the underlying value of the PPM, distributions and further deteriorate senior physician compensation. All of these aspects reinforce an underlying theme: providing a viable path for junior physicians to become partners and/or increase their income to partner levels is critical for the long term health of the practice. Lastly, let’s examine the situation where a senior physician is ready to retire. In order for the physician practice management operations to not be disrupted, the business must recruit a new physician to replace his/her production. In VMG’s experience, a newly recruited physician is unlikely to make an investment in equity on the front end. Therefore the new physician’s clinical salary must be consistent with market levels in order for the PPM to be an attractive employment opportunity. If the clinical salary for the retiring senior partner is not in line with market levels, incremental expense will be incurred to compensate the new physician at a competitive rate. This could result in EBITDA degradation. The retiring partner may also expect a significant purchase price for his equity which should be considered. Many private equity physician practice management deals are sold to physicians with a promise of a “second bite of the apple” which can set physician exit/retirement expectations. In VMG’s opinion, the best way to ensure these issues are addressed is to confirm that the amount of compensation purchased on the front end is at a sustainable level. At the end of the day, any valuation is based on the specific facts and circumstances of the transaction, and in the physician practice management world, it all comes down to salary, succession and sustainability.